The number of days of using ALL secret functions in the "Quick buttons for RPG Apeha.ru (Premium version)" extension with reference to Your Character in the game Apeha.ru plus 3 days as a gift for each month when you purchase more than 29 days. When buying from one year or more - 2 months for each year as a gift! 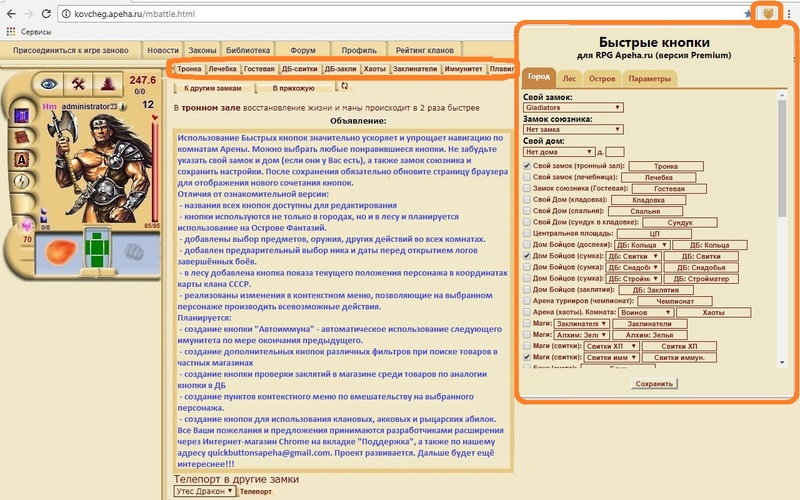 After payment of the goods you will receive a unique code with which you will be redirected to the site quickbuttonsapeha.ru for automatic generation of the Secret code. Also with this Unique code you can contact the address quickbuttonsapeha@gmail.com for manual generation of the Secret code. The number of days purchased is calculated from the moment of activation of the Unique code on the quickbuttonsapeha.ru website, or from the extension settings when you click on the "Get Code" button. You can activate the Unique Code at any time after purchase. In case of changing the composition of secret functions when a new version of an extension is released, you can always update the Secret code by re-entering the Unique code in the extension settings, or on the quickbuttonsapeha.ru website.